Enhydris maculosa: Gyi, 1970: 114 [In part.]. Figure 16. Enhydris vorisi Murphy, 2007: 171. Holotype: KU 92465. Type Locality: Maubin, Irrawaddy Division, Myanmar. Gyiophis vorisi Murphy and Voris, 2014:22. Distribution: Known only from the vicinity of Maubin in the Ayeyarwady River Delta, Myanmar (Murphy, 2007). Diagnosis: Two pairs of chin shields, 142 or more ventrals, dorsal pattern of stripes that are lateral and dorsal, and may break up into smaller spots. All of these traits separate it from G. maculosa, a species with which it has been long confused. Etymology: Named after Harold K. Voris, Curator of Amphibians and Reptiles at the Field Museum of Natural History, for his many contributions to the study of the ecology and evolution of the herpetofauna of Southeast Asia. Size: Four males had SVLs that ranged from 378-406 mm (=390.2 mm, SD=12.4) and tails that were 90-102 mm (95.8 mm, SD=4.9); male tails were 24-25% of the SVL. Seven females had SVLs ranging from 371-505 mm (=429.6 mm, SD=48.3) and tails that were 73-86 mm (= 81.1, SD=5.2); female tails were 16-24% of the SVL. Head depressed; rostral twice as broad as tall, visible from above; nasals semi-divided with nasal groove contacting first labial, nare in center, about same diameter as orbit; internasal small, quadrangular, not in contact with loreal; loreal quadrangular, in contact with first three upper labials; two prefrontals make broad contact with each loreal; frontal pentagonal and 1.2x longer than supraocular; parietals entire; temporal scale formula 1+2+3; upper labials 8/8, sixth largest, eighth the smallest, fourth enters orbit; lower labials 10/10, seventh elongate, first four contact anterior chin shield; anterior pair of chin shield largest and elongated, second pair small. The temporal formula was usually 1+2+3, but one side had 1+3+3 and another had 1+3+4. Dorsal scales rows: 26-28 (usually 27) on neck, 25 at mid-body, 23-21 in front of vent. Dorsal scales in the first several rows are almost square. Dorsal scales become more lanceolate toward mid line of body Ventral scales 142-152, males 147-152 (=148.8, SD=2.2) and females 142-148 (=145.2, SD=2.6). 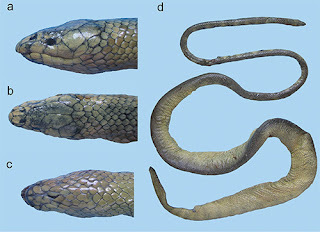 Subcaudal scales were 41-58, males 51-58(=54.3, SD=2.9) and females 41-53 (=46.6, SD=5.1). Color pattern: center of each ventral is a uniform cream; the outer edge of ventrals, the first row and the lower portion of scale row two of dorsal scales have a broad, dark brown zig-zag stripe that runs the length of the body and tail extends onto the chin. Upper portion of scale row two, row three, and lower portion of row four have a cream stripe. Rows 5-7 have a series of black spots that fuse together in places to form a dark stripe. Rows 10-14 have a series of black vertebral spots (about 29) that involve 5-8 scales and may fuse to form an intermittent stripe. The Maubin area is located in the Ayeyarwady Freshwater Swamp Forest ecoregion of Wikramanayake et al. (2002). None of the specimens examined contained prey. A 450 mm SVL female (KU 92397) contained five oviductal eggs (Murphy, 2006).